While most countries are looking for ways to stop illegal immigrants from entering, the Chinese regime is looking for ways to prevent its own citizens from escaping. A new frontier monitoring system was detailed by the Chinese Communist Party’s (CCP) state-run China Daily news outlet on Nov. 6. It uses advanced radars and unmanned aircraft to track people, and has already been deployed by border defense units in Xinjiang, Yunnan, and Tibet. While the system is being touted as a way to stop drug trafficking and illegal border crossings, it will likely be used to track and arrest persecuted minority groups—particularly Muslim Uyghurs in Xinjiang, and Tibetans as they try to escape the Chinese regime. 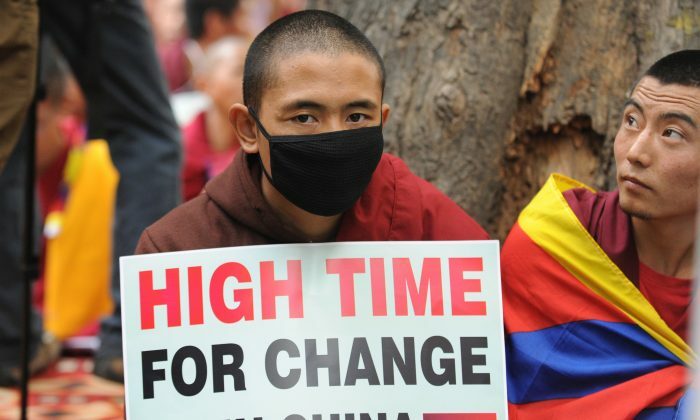 According to Alistair Currie, spokesman for the activist group Free Tibet, the new surveillance system adds yet another layer of risk to Tibetans hoping to escape the Chinese regime’s rule, which often means taking the dangerous hike to Nepal. “It is already extremely difficult for Tibetans to escape from Tibet, especially via overland routes,” Currie said, in an email interview. Chinese soldiers along the borders have been known to shoot and kill Tibetan refugees—including women and children—as they try to flee China. These killings were caught on film in 2008, and showed Chinese soldiers shooting Tibetans near the Nangpa La Pass, as they were trying to reach Nepal. Over the years, according to Currie, this journey has only become more difficult for Tibetans. He said they’ve “seen a huge decline in numbers of refugees,” which went from thousands per year, to hundreds, and to possibly just dozens now. The system was designed by the Southwestern Institute of Technology and Physics, which is a subsidiary of China North Industries Group Corp—one of the CCP’s main weapons manufacturers. According to China Daily, the surveillance system is able to watch the borders around the clock, and functions in all weather. It uses electro-optical devices, radars, communications equipment, command-and-control instruments, and tools for image analysis. A representative from Southwestern Institute of Technology and Physics, Mao Weichen, told China Daily that the CCP currently has border monitoring systems in place—particularly in Xinjiang, Guangdong, and Heilongjiang, but these mainly rely on just video surveillance. Acoustic weapons use sound to injure, incapacitate, or kill people. Weapons of these types are typically used for crowd dispersal with more powerful ones causing pain and disorientation, while lighter ones are known to cause nausea or discomfort. Currie said the concern over the new surveillance system goes beyond Tibetans trying to cross the borders, however. “Having a ‘spy-in-the-sky’ in border areas also increases the opportunities for the state to monitor Tibetan activity in those areas unrelated to the border itself,” he said. While news of human rights abuse in Tibet has become quieter, the CCP’s suppression of Tibetans and other groups in China hasn’t slowed down. The slowing of information can be partly attributed to the Chinese regime becoming more efficient at suppression. “We are certainly aware of instances of torture several years ago and there’s little reason to believe that will have changed,” Currie said, noting Free Tibet recently received a document from 2014 that details rewards for Chinese border guards in Purang County, which borders Nepal. The document outlines a Soviet-like system to reward people for turning in their neighbors. It outlines how the CCP will reward people for information on “illegal escape and entry into the country” and information on “separatist activities” of Tibetans still loyal to the Dalai Lama. “For information collected by two or more farmers and nomads, an average reward will be given according to the number of people,” it states. The new system will take what is already an extremely authoritarian program to a new level. “Clearly, a system based on technology offers substantial advantages over the use of community members who will usually be extremely resistant to providing such assistance to the regime,” Currie said. He noted that the CCP’s state mouthpieces tend to exaggerate in their reports, but the system will build on other systems currently in place—which have already made escape very difficult for Tibetans. “China’s national security infrastructure in the west—including roads, rail, and airports, which are proliferating in Tibet—is equally useful for enabling the deployment of forces for repression in Tibet wherever its needed,” Currie said.